LATEST INNOVATION by Palmers’ – The new age moisturiser in a can! NO propellants to deliver fine sprays which allow the lotions to be very quickly absorbed into the skin. Palmers’ was founded in America more than 170 years ago in 1842, Palmer’s has become one of the world’s leading names in skincare, a brand that women around the world have grown up with. Their unique heritage and commitment to quality has stood the test of time. Generations of families have loved the fantastic moisturising qualities of Palmer’s skincare range, and millions of women around the world agree – Palmer’s can be found in bathroom cabinets in the homes of families in more than 80 countries, making it one of the popular skincare brand. Their #1 formula, Cocoa Butter Formula, is one of Palmer’s key offering in its wide range of skincare. Today, Palmer’s is still committed to creating affordable products that really do work, growing to provide a Palmer’s product for every skincare need: hand and body care, facial care, stretch mark care, hair care, body care and personal care. Spray and soothe itchy, stretching skin with pure Cocoa Butter, Vitamin E, Soy Lechithin and Bio C Elaste. Bio C-Elaste is a powerful combination of Centella Asiatica, Collagen, Elastin, Sweet Almond Oil and Argan Oil that absorbs quickly into skin while providing 24 hour stretch mark fighting moisture. This convenient spray targets hard to reach stretch mark prone areas, provides deep moisture, soothes dry itchy skin and supports skin elasticity in a non-greasy, easy spray application. For best results, hold can 3-4 inches (7-10 cm) from skin and spray a continuous motion all over stretch mark prone areas. Gently rub into skin. Apply as often as needed or whenever skin needs a quick moisture boost. and non-greasy formula allows you to get dressed in a jiffy! Crafted especially for use “on the go”. Argan Oil: has twice as much Vitamin E as olive oil and is rich in essential fatty acids and vital antioxidants. Helps soften and condition skin while reducing scarring. 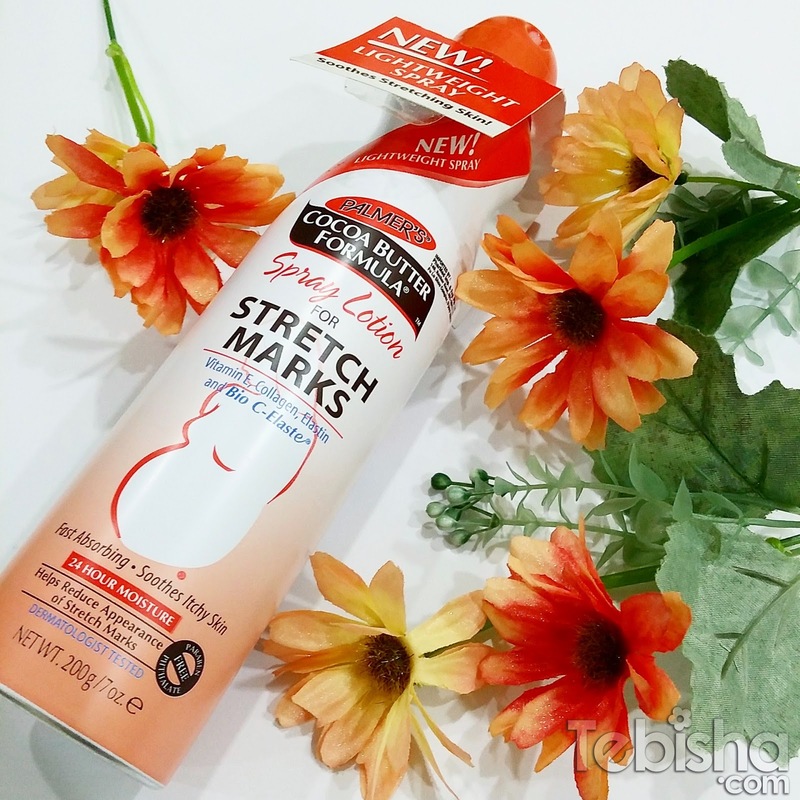 Palmer’s Stretch Mark Spray Lotion is available at Watsons, Guardian, Fairprice, BHG, Robinsons, John Little and leading cosmetic stores.